Improved Initiative: Sabertron: The Best Thing To Ever Happen To Boffer? Sabertron: The Best Thing To Ever Happen To Boffer? Before we get started with this week's Moon Pope Monday post I'd like to give my readers an update. I've been steadily working to get my previous character build articles up and running again, and as of today my Gotham Knights series has been re-posted and collected at this link right here. You can also see the complete archive of character conversions by clicking the tab above and to your right. Yes, it's exactly what you think it is. What you are looking at is something that every kid would squeal with joy to find under the Christmas tree (and if we're honest, most of us so-called "adults" would do the same). 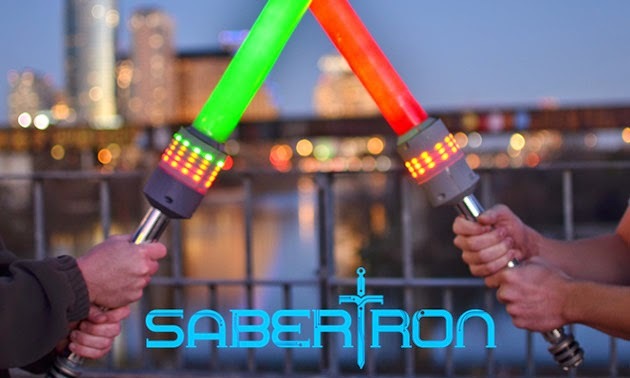 Sabertron is a sword fighting system that can tell the difference between a blow on the wielder and a blow on his or her sword, and which can keep score electronically. So while cheap shots and dirty fighting are still part of the game there's no denying that one opponent managed to strike the other. Seriously, check out the promo video they put together for this thing. I want one. Hell with that, I want four. As always, thanks for dropping in on Improved Initiative. Feel free to like this post on FB by clicking the window on your upper right hand side, and if you'd like to keep up on all of the blog's updates plug your email into the box on your right, or follow me on Facebook and Tumblr.